A modern control room where plant information and controls are displayed on computer graphics screens. The operators are seated as they can view and control any part of the process from their screens, whilst retaining a plant overview. Functional levels of a manufacturing control operation. Referring to the diagram: Level 0 contains the field devices such as flow and temperature sensors (process value readings - PV), and final control elements (FCE), such as control valves; Level 1 contains the industrialised Input/Output (I/O) modules, and their associated distributed electronic processors; Level 2 contains the supervisory computers, which collate information from processor nodes on the system, and provide the operator control screens; Level 3 is the production control level, which does not directly control the process, but is concerned with monitoring production and monitoring targets; Level 4 is the production scheduling level. To determine the fundamental model for any process, the inputs and outputs of the system are defined differently than for other chemical processes. The balance equations are defined by the control inputs and outputs rather than the material inputs. The control model is a set of equations used to predict the behavior of a system and can help determine what the response to change will be. The state variable (x) is a measurable variable that is a good indicator of the state of the system, such as temperature (energy balance), volume (mass balance) or concentration (component balance). Input variable (u) is a specified variable that commonly include flow rates. It is important to note that the entering and exiting flows are both considered control inputs. The control input can be classified as a manipulated, disturbance, or unmonitored variable. Parameters (p) are usually a physical limitation and something that is fixed for the system, such as the vessel volume or the viscosity of the material. Output (y) is the metric used to determine the behavior of the system. The control output can be classified as measured, unmeasured, or unmonitored. Processes can be characterized as batch, continuous, or hybrid. Batch applications require that specific quantities of raw materials be combined in specific ways for particular duration to produce an intermediate or end result. One example is the production of adhesives and glues, which normally require the mixing of raw materials in a heated vessel for a period of time to form a quantity of end product. Other important examples are the production of food, beverages and medicine. Batch processes are generally used to produce a relatively low to intermediate quantity of product per year (a few pounds to millions of pounds). A continuous physical system is represented through variables that are smooth and uninterrupted in time. The control of the water temperature in a heating jacket, for example, is an example of continuous process control. Some important continuous processes are the production of fuels, chemicals and plastics. Continuous processes in manufacturing are used to produce very large quantities of product per year (millions to billions of pounds). Such controls use feedback such as in the PID controller A PID Controller includes proportional, integrating, and derivative controller functions. Applications having elements of batch and continuous process control are often called hybrid applications. Example of a continuous flow control loop. 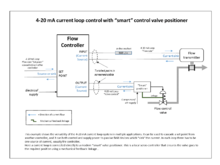 Signalling is by industry standard 4-20 mA current loops, and a "smart" valve positioner ensures the control valve operates correctly. Example of level control system of a continuous stirred-tank reactor. The flow control into the tank would be cascaded off the level control. ^ a b c Young, William Y; Svrcek, Donald P; Mahoney, Brent R (2014). "1: A Brief History of Control and Simulation". A Real Time Approach to Process Control (3 ed.). Chichester, West Sussex, United Kingdom: John Wiley & Sons Inc. pp. 1–2. ISBN 978-1119993872. ^ Minorsky, Nicolas (1922). "Directional stability of automatically steered bodies". J. Amer. Soc. Naval Eng. 34 (2): 280–309. doi:10.1111/j.1559-3584.1922.tb04958.x. ^ Bennett, Stuart (1996). "A brief history of automatic control" (PDF). IEEE Control Systems Magazine. 16 (3): 17–25. doi:10.1109/37.506394. ^ Bequette, B. Wayne (2003). Process control: Modeling, Design, and Simulation (Prentice-Hall International series in the physical and chemical engineering science. ed.). Upper Saddle River, N.J.: Prentice Hall PTR. pp. 57–58. ISBN 978-0133536409. ^ a b c d Smith, C L (March 2017). "Process Control for the Process Industries - Part 2: Steady State Characteristics". Chemical Engineering Progress: 67–73.